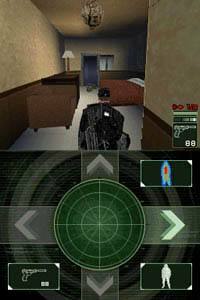 You are Sam Fisher, the most elite black-ops agent of the National Security Agency (NSA). To accomplish your mission, you will kill from close-range, attack with your combat knife, shoot with the prototype Land Warrior rifle, and use radical suppression techniques such as the inverted neck-break. You will undertake cooperative multiplayer infiltration missions, where teamwork will be your ultimate weapon. As your enemy evolves, so must you. Sam Fisher once again returns to the portable console world in Tom Clancy's Splinter Cell: Chaos Theory for the DS that actually includes many of the same features that graced the XBox version. Unfortunately the DS version, although highly ambitious, fails to use the handheld console to its advantage which unfortunately becomes a very uncomfortable gaming experience. 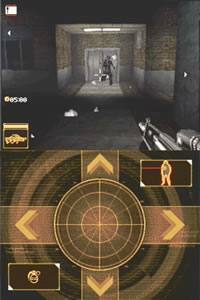 The developers have tried to combine the touch screen of the DS with the gameplay of the Splinter Cell series and what should of been an entertaining experience becomes rather complex because the gamer must use just about all buttons on the system if they want to live. Targeting is the biggest problem in the game, aiming the touch screen, firing with the buttons and moving with the d-pad. Just like the console versions, Fisher takes up quite a bit of screen space and trying to just see your enemy is difficult. Fortunately the enemy just walks around in pre-determined patterns, usually a loose circle. They sport little of the AI the series has become famous for as the average graphics engine alone has enough trouble rendering things smoothly. Using night vision or thermal goggles sends the game into a frame fit, rendering the game unplayable in these two vision modes. The camera is probably the second biggest deterring factor, never keeping up and rarely being in position to make the right move. Attempting to manoeuvre around boxes is extremely difficult. You'll likely need to stop, adjust the camera with the touch screen and then make your move. Since the game is paced as it is, it's not terribly out of place, but that doesn't excuse not making these levels fit the console better. The lack of an analog stick means Fisher can only run or crawl. There's no sneaking up on someone by walking lightly as you'll need to do that in a crouch. That also means just manoeuvring Sam out of corner is unnecessarily confusing which can be blamed on the camera and the controls combined. The extended missions on the DS randomly save at certain points for some added portability, yet there's no indication of when you'll be near a spot. These extended missions closely mimic the home version of the title, though the voices have been cut and the music unfortunately becomes monotonous, although extremely high quality. There are two multiplayer modes but both suffer from the same old problems of fiddly controls and sluggish graphics. Two player co-op sees one of you taking on the role of a computer hacker type while the other deals with the guards - not a bad system but it's annoying that your partner doesn't show up on the radar screen so you can't keep track of what he's up to. You'll need more than two players to make Versus Mode anything more enjoyable than a simple game of hide and seek and since you need a cartridge for each player you'll need to buy more copies of the game than really deserve to be sold - in short, it's just not worth it. Graphically, the title looks a little dated on the DS and features rather bland graphics that combine pixilation with poor frame rate issues. 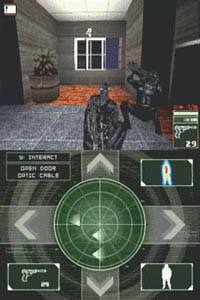 Even the the special effects in the game such as the night vision or infra vision makes the unit come to a halt and does interfere with the gameplay. 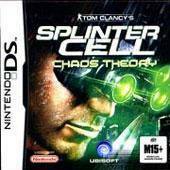 So does Chaos Theory DS have any redeeming features? Well, if you're a die hard Splinter Cell fan, you might learn to live with the shonky control system and poor quality graphics. It's not as if the game is completely unplayable, after all. However, it's not varied or involving enough for our tastes and the ratio of frustration to enjoyment is far too high.